Used in torpedoes, grenades, rocket engines, in combination with nitroglycerine it is used to make smokeless powder and blasting gelatine. Nitrocellulose is a secondary explosive – it is very resistant to shock, but it is flame sensitive (however, in contact with flame, it doesn't detonate, but just burns very rapidly). 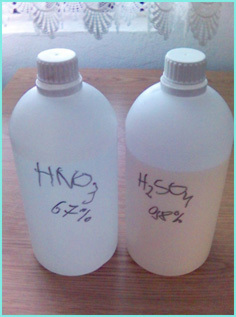 The following chemicals are needed for the synthesis of this compound: nitric acid (w ~ 70%), sulphuric acid (w = 98%), cellulose (cotton, paper or something similar) and sodium bicarbonate. Along with the mentioned compounds, an ice bath, a thermometer and a few lab beakers or similar containers should also be prepared. First, 30 mL of nitric acid, and 70 mL of sulphuric acid were measured, and each of these was poured in its separate bottle and left in the freezer for a few hours. 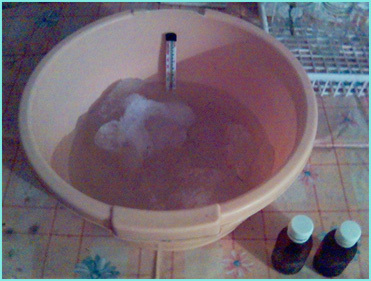 After the chemicals have cooled, an ice bath was made using a wide plastic bowl in which cold water was poured together with some ice. A glass beaker was placed in the middle of the bath. After that, nitric acid was poured in the beaker, and slowly sulphuric acid was added. At that moment, the temperature jumped over 50 °C. 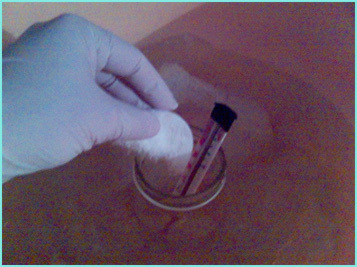 The acid mixture was then left in the ice bath to slowly cool below 10 °C. When the temperature dropped below 10 °C, 10 grams of cotton was added in small portions. While adding cellulose, the temperature was not allowed to rise above 25-30 °C. 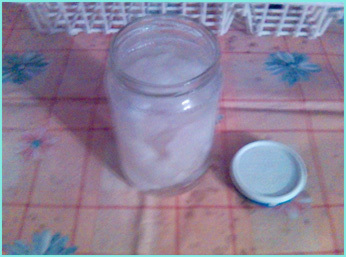 After all the cellulose was added, the solution was left in the ice bath for another hour. The solution was stirred every 15 minutes or so. After one hour, the solution was (together with the NC), poured into a bigger beaker with cold water. After that, the nitrocellulose was picked up with a stirring rod, and transfered to a new empty beaker. After that, a sodium bicarbonate solution was prepared, by dissolving 12.5 grams of the mentioned substance in 237.5 mL of water. The nitrocellulose was then added to this solution, so that it could be neutralised. After the neutralization, the solution was filtered and the separated nitrocellulose was spread on a cardboard lid in order for it to dry faster. After it dried completely, it was ready to be stored. This compound is stable at room temperature, and will not detonate upon flame contact unless it is very densely packed in a confined space.